Photo Friday: A New Home – and a New (Kind of) Church Paper – in Nappanee, Ind. 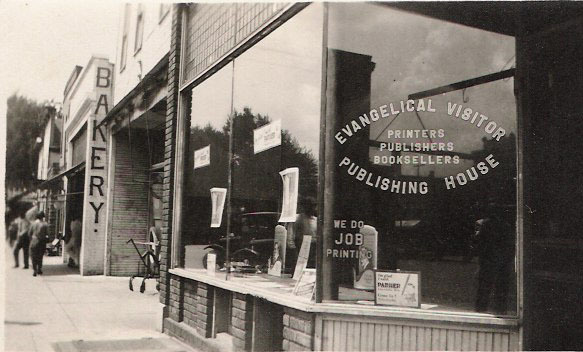 The first home of Evangelical Visitor Publishing House (later Evangel Publishing House) in Nappannee, Ind., where the Brethren in Christ Church relocated its press in 1919. Courtesy of the Brethren in Christ Historical Library and Archives. When Vernon Stump of Nappanee, Ind., succeeded George Detweiler as the editor of the Evangelical Visitor in 1919, the publication was just over thirty years old. Still in its infancy, the paper — which included “[n]ews of church life, sharing of personal testimonies and needs, promotion of common beliefs, and the publicizing of brotherhood enterprises”  — was fast becoming a critical component of denominational life among the geographically disbursed Brethren in Christ Church. Today’s Photo Friday shows the first location of the publishing house following its move from Harrisburg, Pa., to Nappanee, Ind. — where it has remained (at various physical locations) for almost a century. The move was precipitated by Stump’s installment as editor — by no means a minor transition. Stump’s move into the editorship followed the expulsion of Detweiler, an apparent political move meant to install as editor someone with significant sympathies toward the Wesleyan Holiness doctrine of second-work sanctification, which was quickly gaining ground with much of the denomination. Committed to the teaching of Justification, Sanctification, The Second Coming of Christ, Divine Healing, and all sacred ordinances and truth pertaining to the Christian life. . . .
As such, the move to Nappanee meant not just a new home for the Evangelical Visitor, but a new kind of church paper altogether. Carlton Wittlinger, Quest for Piety and Obedience (Nappanee, Ind. : Evangel Press, 1978), 269. General Conference Minutes, 1918, Article 41, 43, cited in Wittlinger, 339. [George Detweiler], Evangelical Visitor, December 16 & 30, 1918, 3, cited in Wittlinger, 339. Devin – Good & interesting piece. People are people with a mixed bag of motivations.